Recently, I was able to take a trip down to McAllen and Mission and see the results of our state investment in border security first hand. As you may recall, last session the Legislature approved over $800 million in new funding for border security operations. This funding has proved to be critical for slowing the flow of illegal immigration and has been incredibly effective at locating and eliminating the routes used by drug traffickers. It was encouraging to see how law enforcement has been able to utilize the resources to make our state safer. I would like to thank all the Department of Public Safety (DPS) troopers, game wardens, as well as all the local municipal and county law enforcement officials who have worked so hard to secure our safety. During my visit, I was briefed by Commander Jose Rodriguez, the DPS Region 3 Commander. He is directly responsible for our state troopers who are working the border region. 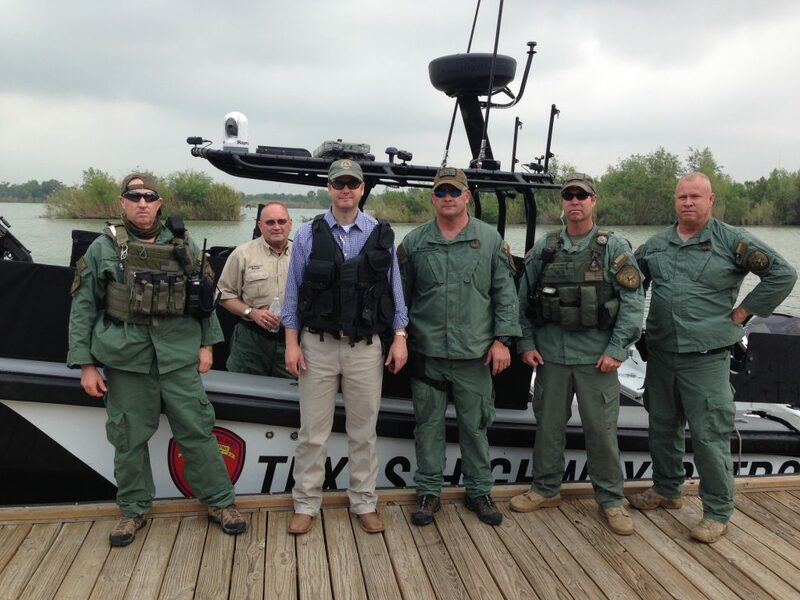 He led my tour, and I was able to witness the border operations from one of the DPS Patrol boats, which the agency uses to intercept drug cartels when they encounter them on the Rio Grande river. DPS operates 6 of these boats, and each one is powered by three 300 hp outboard motors with five .30 caliber machine guns onboard. I remain committed to fully supporting our border security efforts, and I look forward to building on this foundation during the next legislative session. This week in our series on the House Interim Charges we will be cover the House Committee on Culture, Recreation, and Tourism. This is one of my favorite committees, because it has jurisdiction over all hunting and fishing laws in Texas, and it oversees our State Park system. First, the Committee is charged with monitoring the repair of state parks from damage caused by natural disasters, including flooding and wildfire events. They will then study programs in Texas and other states to identify best practices for preparing for these natural disasters and for mitigating their effects. The committee will then explore ways to promote and improve tourism, youth education and economic development through heritage, cultural, recreational, historical, and nature programs and preservation practices. Through this, the committee will consider the long term economic impact of state parks and local historical sites such as the Texas Heritage Trails Program and the Alamo Mission Complex. The mobile office will hit the road for the month of April, with the first stop being at the Leon County Courthouse in Centerville from 9:00am until 11:00am on April 6th. Later on the afternoon of the 6th, we will be at the Madison County Courthouse Annex in Madisonville from 1:30pm until 3:30pm. Then, on April 20th we will be at the Houston County Courthouse Annex in Crockett from 9:00am until 11:00am, and at the Trinity County Courthouse in Groveton from 1:30pm until 3:30pm. The mobile office will wrap up for the month of April at the San Augustine County Courthouse from 9:00am until 11:00am on April 27th. As always, please do not hesitate to contact my office if we can help you in any way. We look forward to the opportunity to hear your concerns and help you navigate state government. My district office may be reached at (936) 634-2762 or you can call my Capitol office at (512) 463-0508.